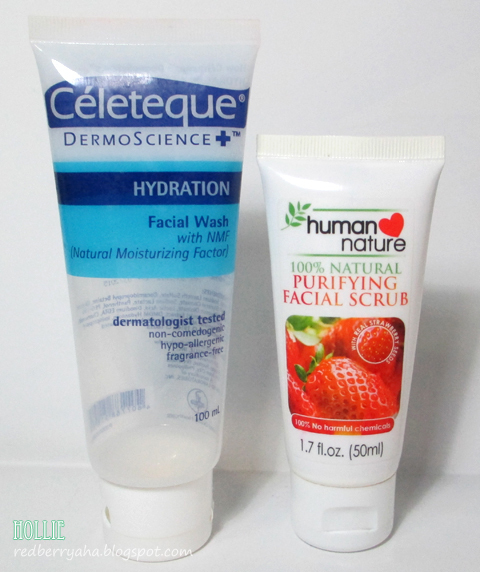 Celeteque Hydration Facial Wash - This is my favorite facial wash and I have been using it for about 3 years now. I like this because it is really mild, it cleanses well and does not dry or tighten my skin. Plus, it's very affordable and can be found easily on our local groceries. Human Nature Purifying Facial Scrub - I received this as a gift early this year and been using it since January. Unfortunately, I don't like it. Though it is made from natural ingredients and the smell is pleasant; the beads that come with this facial scrub are too big and too gritty. 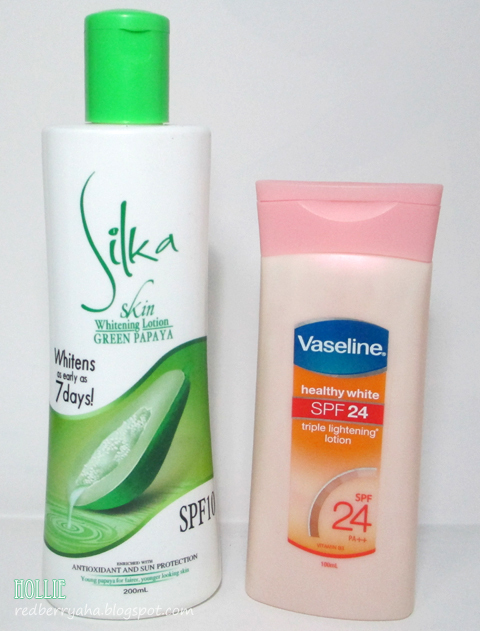 Silka Green Papaya Whitening Lotion - This is the only whitening lotion I have been repurchasing over and over again. It is very affordable and it works. 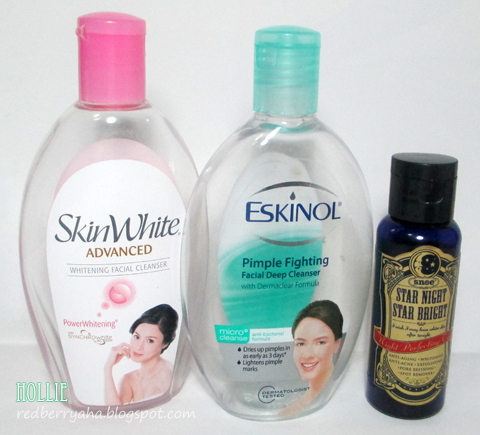 I use this together with the Silka Green Papaya Soap and some times the Silka Green Papaya Body Wash. This smells really good too. The only downside to this is it only has SPF10 which is too low for protection, but it is okay for me since I rarely get exposed to the sun. Vaseline Healthy White Lightening Lotion - I used this up quickly since I only tried the 100ml bottle. It is a good product considering the price. It has a pleasant smell, very similar scent to a typical sunblock. But I find the texture a bit thick. 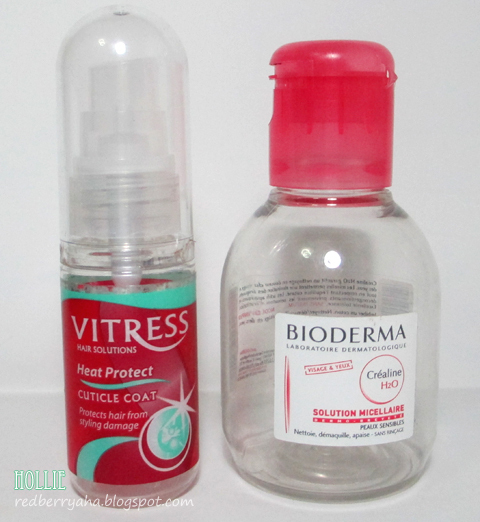 Vitress Heat Protect Cuticle Coat - I like to apply this cuticle coat while my hair is still damp. It smells really great and it softens my hair. This is the only product I use before I blow dry my hair. It's affordable too. I want to try other heat protect products but they're too pricey. Bioderma Crealine H20 Solution Micellaire - Hands down, the best makeup remover I have ever used! I will definitely repurchase this. You can read my full review HERE. 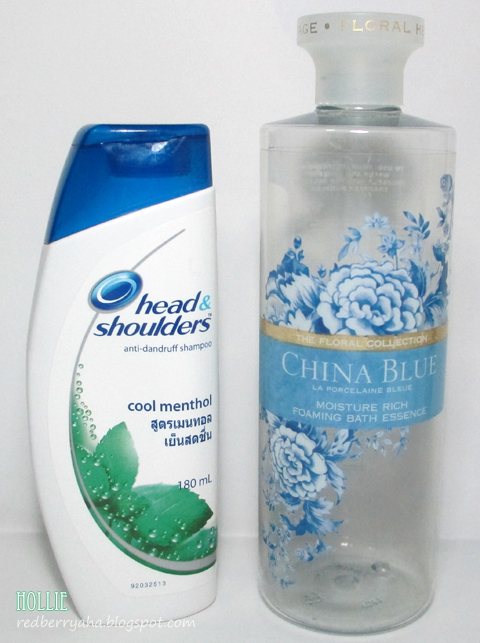 Head and Shoulders Anti-Dandruff Shampoo in Cool Menthol - This is my all time favorite anti-dandruff shampoo. Even my husband loves this too. I have tried anti-dandruff shampoos from other brands but I keep coming back to this, simply because it is the only one that really works. Marks & Spencer China Blue Foaming Bath Essence - I received this as a gift from my younger brother last Christmas and it took me 6 months to use up the whole bottle. The scent is lovely, and I only needed a few drops on my sponge to get a rich lather. However, I won't be repurchasing this as I want to try other brands. Skinwhite Advanced Whitening Facial Cleanser - I use this on my neck area only, because it has darkened a lot and I wanted to try a strong whitening astringent to help lighten it. I've repurchased this several times and my neck has lightened quite a bit. If you know of a product that could really help lighten my neck, please do recommend it to me. Eskinol Pimple Fighting Facial Deep Cleanser - This is the toner I use when I have breakouts, because it does help dry out my pimples. I know it is not advisable to use alcohol based toners, but I had to use it since it works on me. I just apply a thin layer of moisturizer afterwards as this one really strips off facial oil. Snoe Beauty Star Night Star Bright Night Perfecting Toner - I really love how effective this toner is. But I didn't repurchase it since, I've heard somewhere that Snoe will be replacing this with a new formulation. (not sure if it's true though) You can read my full review HERE. Beyonce Pulse Perfume - I got this as a present from my Hubby last Christmas and I have been using it ever since. This instantly became my everyday perfume since hubby likes the scent. On special days, I use my all time fave Clinique Happy. You can read my full review of Beyonce Pulse HERE. How bout you ladies, what products have you finished recently? hi hollie :) i agree with you about the Vaseline lotion. i got a sample size from F21 freebie together with the other versions of this lotion. and its too thick for me. i also used it up really fast. 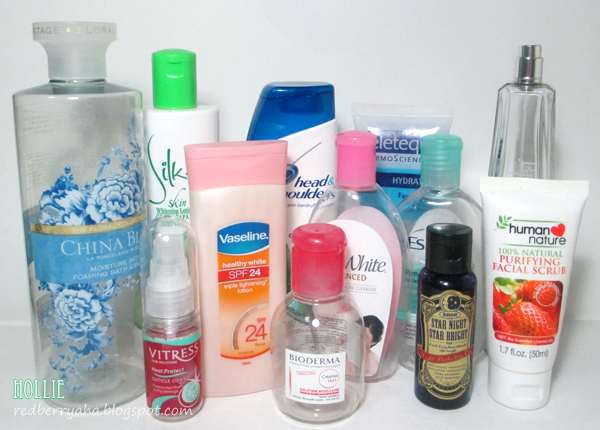 Need a lot of product in order to get enough moisture for my uber dry skin. ;D thanks for sharing this!